Teachers and parents alike hope for small class sizes. 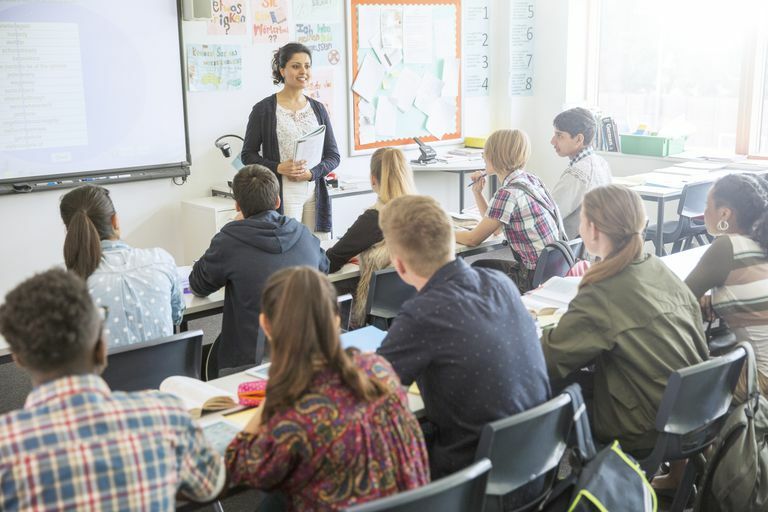 Both groups see small class sizes as a way to reduce the overall workload for a teacher, which allow teachers to provide more attention for students. This can lead you as a parent to get concerned when you find out how many students are in your child's class. You may think to yourself about how difficult it would be if you were to have 25 third graders or even 40 high school students packed into one classroom at a time. If you are wondering why some schools choose to have so many students per class, the answer is money. Paying for more teachers and maintaining more classrooms can be very expensive. So expensive that it may not be the best use of the money school districts have available. Rather than hiring more teachers to reduce class sizes, some school districts may feel it's more beneficial to have more professional training offered to current teachers, to increase pay or benefits for their current teachers, or put the money towards improved curriculum materials and technology. How Can You Tell If Your Child's Class Is Too Big? Educational research has not identified any perfect class size cut off points, so there isn't one specific recommendation that will work everywhere. A 2011 review of education policy researchers Matthew Chingos and Grover Whitehurst explained several different factors that go into how successful different size classes can be. Going over the factors can help you determine if the class size is appropriate or not. The researchers seemed to consider class sizes large when they were over 25 students in kindergarten or first grade, thirty students in third through fifth grade, and over 40 students in the remaining grades. While researchers use these class sizes to describe what a large class is, what research suggests about the effects of large classes on student learning was dependent on other factors. Kindergarten and first graders are just getting started in their educations. They are learning the very basic building blocks of reading, writing, and math that the rest of their education will rely on to continue. Additionally, these young children are still learning how to behave and get along with other children in school. Research shows that when these classes are limited in size to less than 20 students, the children do indeed learn more during the early years, are more successful throughout their schooling, and are more likely to attend college. This seems to be the most important factor in how effective a teacher can be when class sizes increase. Research shows that in countries with fewer requirements to become a teacher do benefit from smaller class sizes. Countries that do have high standards to qualify to become a teacher found that there was little or no benefit to reducing class sizes. The takeaway is that reducing class sizes is only really effective when a teacher has little experience or does not have a high-level understanding of teaching. In most US public schools teachers at least have a bachelor's degree and will have a semester of mentored classroom teaching experience before they can be hired as a regular classroom teacher. Teachers who have masters degrees and years of experience may not enjoy the increased workload, but can still be very effective in classes with a large number of students. Teachers who are in the early stages of their career can benefit greatly by taking advantage of any professional development or mentoring available. These are the students who are experiencing any number of situations that can make it hard to succeed in school. This includes students with unique learning needs that require an IEP or 504. It also includes students from low-income homes where the parents may be too busy trying to earn money to stay afloat to have a great deal of time to support their children's education. Students coming from families that have not achieved a high level of education themselves can fall into this group. Research shows that classes with a high percentage of these at-risk students do benefit when class sizes are reduced. There are also numerous research studies using other methods to help this wide variety of students become successful, including after-school tutoring programs and parent support classes. It may be that providing other avenues of support provide greater benefit than reducing class size. Still, the greater the percentage of at-risk students, the more effective a teacher can be when the class size is reduced. If you have decided to do some research on how schools compare, you may have noticed that some places report class size while others report student to teacher ratios. The class size is how many students in a particular class group. The student to teacher ratio defines how many students to the number of teaching and assisting adults in the class. If the class uses co-teachers or in-class tutors, the number of students to teachers drops quickly. These classes are already benefitting from having more available help for each student. If you have read this article and you are still concerned about your child's ability to succeed in a large class, there are steps you can take to help improve the situation. As is often the case with concerns about school, you can begin by asking your child's teachers for suggestions on what parents may be able to do at home to help support the class. If you are able to help during the school day perhaps you could volunteer in the classroom, which would improve the student to teacher ratio. Other volunteer tasks, ranging from sharpening pencils to chaperoning on field trips can help reduce the pressure a teacher may feel from having a large class. To improve the situation in your child's school district in future years, you can advocate to state and local policy leaders to reduce class sizes.